Blue Heron Biotech’s GeneMaker® is a unique, robust, automated design and synthesis platform. 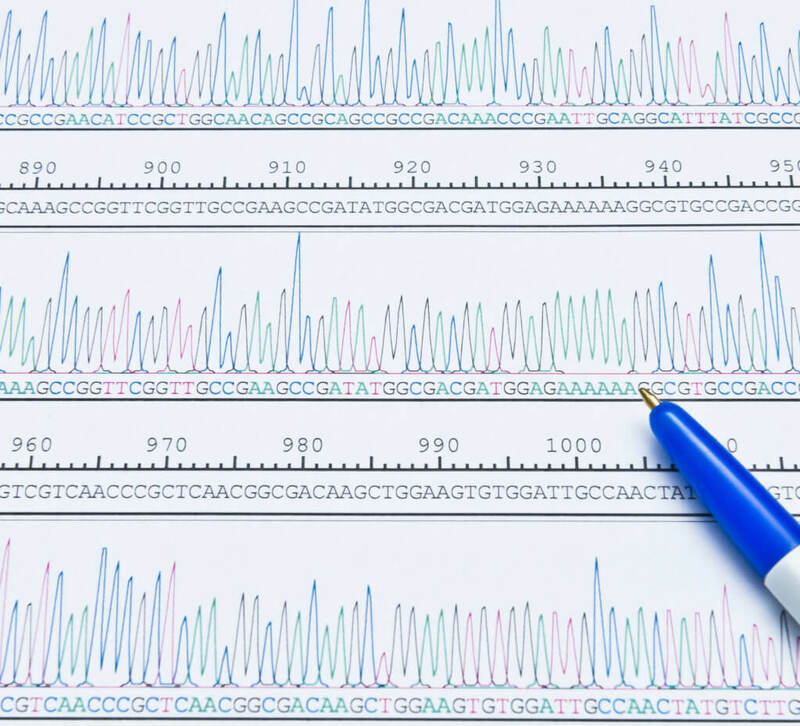 Unlike commonly used PCR synthesis methods, GeneMaker® incorporates multiple novel technologies to first design and later synthesize each DNA sequence. The GeneMaker® manufacturing process is fully automated, so Blue Heron can scale rapidly according to your needs. With a suite of online tools and a dedicated customer service team, ordering gene synthesis has never been easier. Genemaker® is a fully automated gene synthesis platform that covers the entire synthesis process. Ordering begins on our dedicated secure website. Simply log in and enter your desired sequence. Then our proprietary algorithm will optimize the best build for your gene. Our build strategies strive to reduce complexity and simultaneously promote protein expression. Oligonucleotides are made in house to the highest quality standards. Blue Heron’s oligo synthesis capacity eliminates the need to outsource any synthesis. This allows savings and efficiency to be passed on to our customers. Depending on the complexity and size of your project, we have a variety of assembly techniques. Our proprietary build techniques reach beyond common PCR synthesis methods utilizing solution and solid substrate technologies. Your gene is then cloned into the vector of your choice and sequence verified to ensure 100% accuracy. Each step in the Genemaker® process is held to strict quality control standards, allowing for precise deliverables as well as quick turnaround time. With Blue Heron Biotech’s GeneMaker, you can customize your gene synthesis order to any specifications. We offer Plasmid Preparations, Entotoxin-free options, Glycerol Stocks, Quality Assurance Assistance, and free archiving or genes and vectors. Ordering an additional shipment of your construct is always fast and cost effective. Safety and biosecurity are a primary priority of Blue Heron Biotech. When a customer enters sequence data on our secure website, digital encryption and the highest standards of digital security ensure that intellectual property remains secure and private. We are a founding member of the International Gene Synthesis Consortium (IGSC) who has established a Harmonized Screening Protocol to promote biosecurity. Encrypted sequence data that arrives at Blue Heron’s secure service is checked against an internal database of known pathogenic sequences identified by our automated BLAST check against a list provided by the Center for Disease Control (CDC), US Department of Agriculture (USDA), the Australia Group, and European Union. When an order is placed in GeneMaker, the proprietary algorith designs a “best build” protocol. GeneMaker’s unique design software analyzes the sequence characteristics to determine the ideal set of primary building blocks. The GeneMaker manufacturing database stores the“parts list” and “build instructions.” The software utilizes scores of proprietary rules to avoid commonly-encountered errors including errors of sequence and errors of order. The manufacturing database and process automation software electronically instruct each instrument to make and then assemble the building blocks. Each step in the manufacturing process is integrated with automated quality control steps. Blue Heron Biotech has developed proprietary gene assembly instruments and other technologies to accurately and rapidly assemble sub-components into the final full-length sequence. This is achieved using a proprietary column on a solid support matrix in conjunction with other approaches. Additional technologies perform optimal gene assembly across a wide range of sequence motifs and characteristics. Oligos are synthesized and assembled based on the instructions from the GeneMaker database. Blue Heron builds oligos using cutting-edge automated technology. These oligos are then hybridized into duplexes which and assembled into subtargets using the best build strategy. Every step of the synthesis process takes place within our labs. Blue Heron Biotech maintains the highest levels of synthesis expertise, eliminating the need to outsource oligo production. Only oligos meeting the highest quality standards are used in this process, ensuring quality, consistency, and accuracy are maintained. Genes are cloned into either a standard Blue Heron vector (e.g., pUC derivatives) or a customer-provided vector. Blue Heron provides free archiving of genes and vectors, allowing for fast and cost effective re-shipments of any construct. GeneMaker facilitates an easy re-order process of any gene in any vector by providing each customer a personal archived vector collection. Every sequence synthesized is sequenced using Gold Standard methods of double-stranded, primer walk, Big Dye methodology. 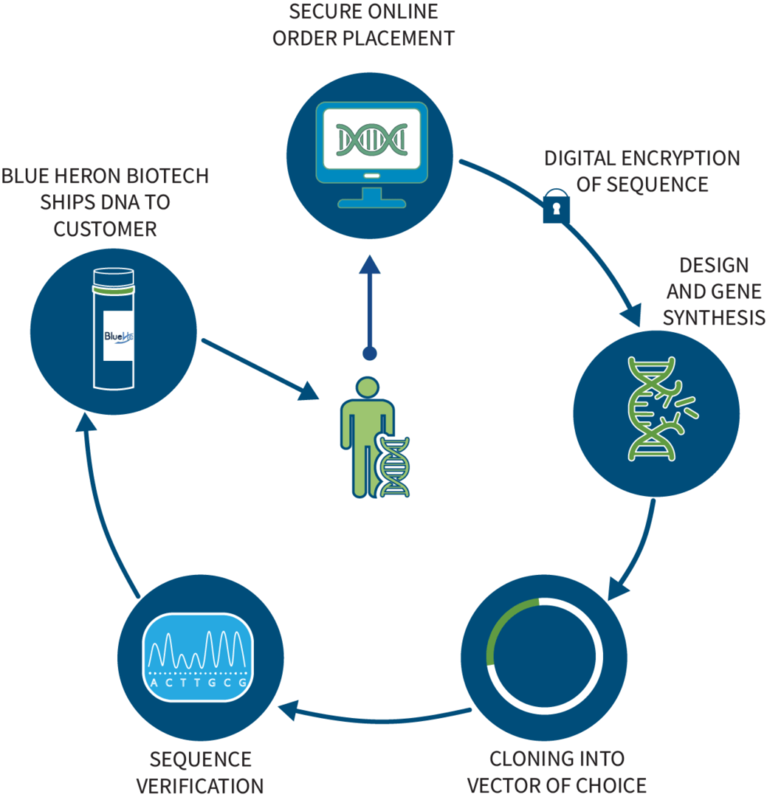 Blue Heron Biotech customers receive the synthesized gene sequence exactly as ordered. Under a tight deadline? Request Express Service for any gene! With our express service pricing and turnaround time are always guaranteed. Turnaround time is dependent on size and complexity of your gene. For non complex genes under 2.7Kb, request an automatic quote for express service via our secure website. Learn more about how to order or contact our Customer Service team for details and quotes for larger and/or complex genes.